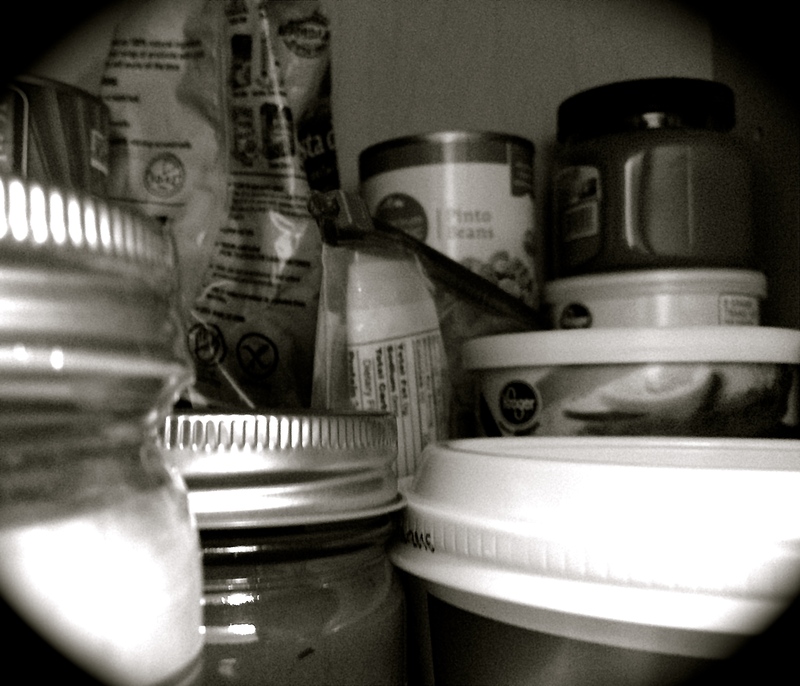 Inside the dark cavern of kitchen cabinets lies our shame and carefully hidden secrets. This is where you’ll find all the junk outlawed during my elimination diet, as well as many unused good intentions pushed behind current favorites. Some items were bought with high hopes, some carried over during the move, and some can be used as evidence against a weak moment at the grocery store. Since my spouse has climbed aboard the autoimmune wagon to help with his arthritis, I have no one except my daughter to pawn off all the formerly savored treats that no longer play well with my digestive system. And, as an upwardly mobile young career gal, she has little time to cook much less eat a good breakfast. So, our forbidden folly sits neglected, taking up guilty room. Truth be told, in order to accommodate more storage in our galley kitchen with little wall space, we need the deeper shelves. We’ve found that our great downsizing experiment requires longer arms and a footstool at hand. In order to reach a dimly remembered ingredient, we have to complete a full evacuation while regretfully reliving one by one the foolishness of our purchases and total lack of willpower in the snack aisle. The one advantage is that as we repeatedly handle our sins, the desire to get rid of the evidence grows stronger, either by conscious effort to cook the malingerer and never buy it again, or by food pantry donation. I am relieved to find that almost all the dry goods, condiments and frozen sundries we hauled from our old house last June have been consumed or recycled. That’s not to say that there might be a few flirty campfire marshmallows, cavorting candy canes and malicious macaroni boxes still lurking in the shameful shadows. Like death and taxes, the presence of forgotten food is unavoidable, but we’ll keep trying anyway. Just give us until April 15th. Once a month for the next twelve, I’ll feature another step in the downsizing journey that didn’t just begin when we sold our suburban house and moved to a small walk-up apartment in June of 2014. This shift to a simpler life has been years in the making, and I hope you’ll join me in my family’s quest to get down to basics. My inaugural post entitled Giving It All Away was featured in July, Make It Stick in August, Following Your Feet in September, Case of the Missing Mac in October, Diminished Drumsticks in November, Dwindling Decorations in December, and Finding Focus in January. I pull open the bag, and there’s that whiff of enlightenment that I’ve sorely missed, the rich caffeinated earth resting inside, denied to me by an elimination diet’s fanatic demands. The steeping pots of loose leaf tea that my husband makes have helped pass the time, but it’s just not the same. As hot water moments off the boil is poured carefully into a filter’s waiting bloom, I reflect on the many ways I’ve prepared the morning’s elixir over the years. It began as a child, begging for a share of my father’s daily routine, with more milk than coffee in the cup. I remember gagging on the diluted insipidness, disappointed that this didn’t come close to the wonderful flavor of coffee ice cream. By college, however, I had learned to drink the cafeteria’s dark sludge (with very little cream) as a badge of sophistication, while I gulped down big burnt carafes during all-nighters in the art studio. 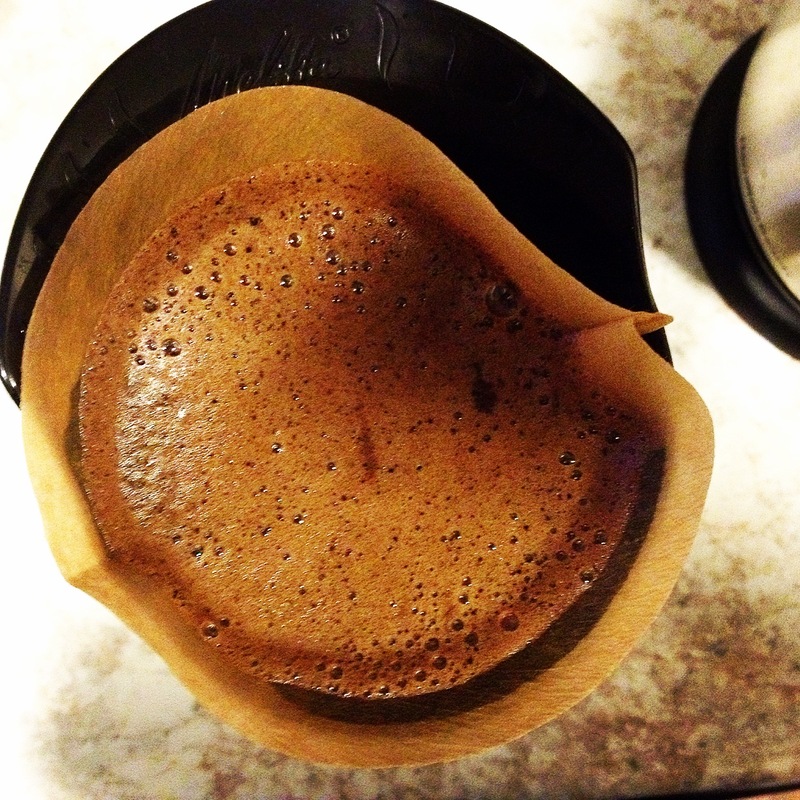 Even though my husband is not a coffee drinker, at our wedding reception I received not one but two espresso makers with open arms, and vibrated around our duplex alone or with other visiting coffee addicts whenever I made a batch of the extra-potent beverage. Daintily sipping from the tiny demitasse set that came with the espresso makers didn’t help, either. From the exotic newlywed caffeinated experience, I then graduated to regular married life with my very own Mr. Coffee, practical, prolific, and always tarry by the time I poured my second cup. The making of smaller batches, while easier to finish without rocketing off into orbit, seemed to scorch faster on the hot plate, and this was years before you could turn off the machine and reheat in a microwave. The quest for a good, small cup of joe led to a string of tiny coffeemakers, from the cute little drip machines that quickly brewed the right amount but lacked the flavor, to pour-over cones for a single cup that cooled too quickly, to a brief foray into steeping coffee bags (only slightly better tasting than instant coffee and just as humiliating), to a knock-off of a popular dispensing brew station that clogged into a dribble. Then there was the attempt to get serious by purchasing a respectable grinder, a bag of eco-friendly and ethically grown beans, and a French press in trendy vermillion green. I confess that this arrangement, while producing great-tasting coffee, was messy and stressful in deciding when to press the plunger. I was irrationally terrified that the flimsy glass beaker would break and an angry, unfiltered mudslide flood my kitchen. Hardly a zen moment. All of which has led me to my current ritual as an occasional coffee drinker. While my body still can’t handle daily doses of the good stuff without considering a spacesuit, I’ve found a method that is cheap, convenient, tasty — and mindful. The new caffeinated practice involves a small bag of good-quality ground coffee, a trusty Melitta #2 pour-over cone in unbreakable plastic, an electric kettle that boils faster than Mount Vesuvius, and a wonderful 16-ounce stainless steel thermos that lets me slowly sip hot coffee as long as I like. All to say that once again, I can find reward in the slow passage of filtered thoughts through grounded intentions, setting the quickened pace for another productive day. 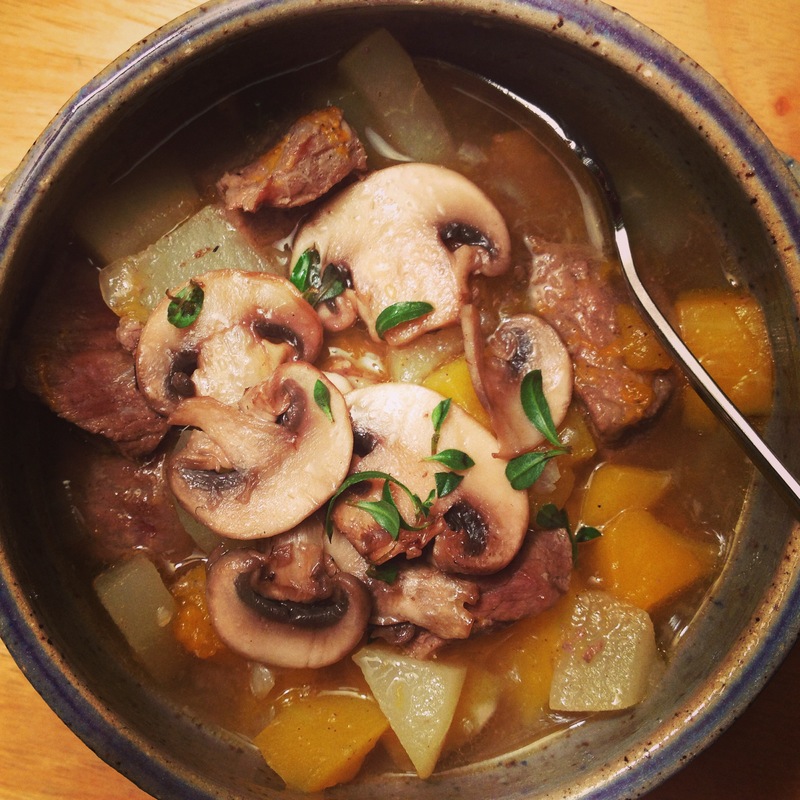 Beef-Butternut Stew with Pear and Thyme prepared from Mickey Trescott’s beautiful Autoimmune Paleo Cookbook. Over three months into the Paleo Approach and Autoimmune Protocol diets (AIP for short) and it’s time for an update from my (rather grubby and well-used) kitchen. As faithful followers of this blog may recall, I began the elimination journey back to my hunter-gatherer ancestors’ fireside feasts on the first day of August. And, despite the formidable lists of forbidden foods and ingredients, bounty from this year’s autumn harvest has been my saving grace. Every week, besides our usual visit to the regular grocery chain, I travel to a local orchard’s farm store to consciously purchase pastured meats, as well as fresh cider and the perfect cooking apples for homemade applesauce and crisp. I buy fermented raw kraut from the Saturday farmer’s market, and gorgeous multi-colored chard from a vegan/GF restaurant that grows its own vegetables behind the building. I’ve taken to hanging around the organic sections, and familiarizing myself with strange, misshapen fruits that hide their beauty on the inside. Sarah Ballantyne, well-known AIP author and cook, challenged herself to buy and prepare any exotic produce that she’d never seen before. 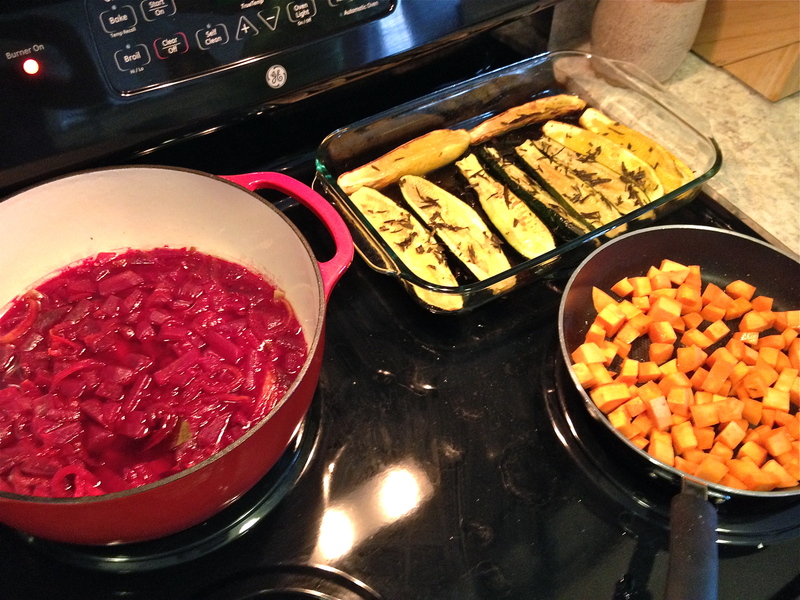 I’m not that adventurous yet, but I’m making friends with some pretty homely root vegetables. As winter sets in, I’ve stocked up on every kind of squash and lined them along my counter, where they wait patiently for me to whip up enough courage to cut into their hard exteriors before softening them up in a slow-roasting oven. I’ve discovered that braising in a tightly covered pot can tame any wild beastie or vegetable into delectable submission. And I utilize everything, from poultry innards and bones, to the tops of beets and fennel — nothing goes to waste if I can help it. Granted, all of this takes commitment. If I still worked at my old job, I wouldn’t have the time or energy. Slow food can take hours, even days to see results. Crock pots, pressure cookers and heavy cast iron utensils can take a toll on your arms, patience and wallet. Our lack of space in the new galley kitchen often leads to a frustrating dance while family members prepare different meals for separate diets. More than once I’ve caught myself longing for the generous side-by-side fridge that we left behind as cabbages and cauliflower roll out of our currently overstuffed apartment refrigerator. But is there a payoff, you ask? How about no more joint pain, considerably less inflammation even after injuries, weight loss without your friends becoming alarmed, and lower doses of medicine, all while chronic conditions grow quiet or go into remission. The benefit to eliminating misbehaving dietary culprits, however socially painful, is that when I reintroduce them, I can usually tell within a day or two whether we can play well together yet. If not, the offending foe is placed on a back burner for another day. While I had hoped for these intended results, what I didn’t expect was the spiritual connection I’ve discovered from taking this often rocky road to recovery. As in life, I’m learning not to wait until I’m starving and desperate to cook and nourish myself. This should be second nature, but in the modern world, we find it so easy to reach for the quick, impersonal calories of convenience that leave us unfulfilled and a little sick. Now, I can take a bite into something that has slowly simmered and stewed in the warm glow of an Indian summer afternoon, and really taste the thought in it. 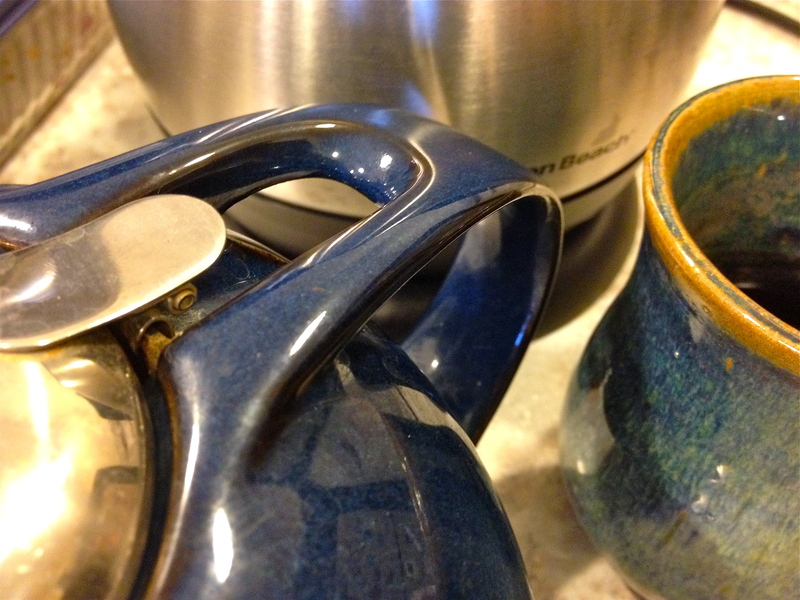 Almost every morning, my husband makes us a pot of tea. Real tea, with loose leaves, a mesh steeping basket, and water brought to boil then just briefly left to sit. He’s even been known to make me coffee, although he doesn’t drink it himself. He says he just likes the smell. And I more than like him. This is the final day of Susannah Conway’s August Break 2014. I want to thank and share the love with all those who liked and supported me this month, in particular commenters Maureen, Bonny, Karuni, Linda and Shirah. Everyone who stopped by kept me going with your camaraderie and encouragement. Plus, a big shout out to Meg of Meg Wolfe Writes, who accepted my double-dog dare, and not only joined Instagram, but also used Susannah’s visual suggestions as a starting point to blog about her own writing prompts while she works on a second novel in her mystery series. If you are a writer, I highly recommend that you check out Meg’s insights! Take away for this second time around: I really enjoyed the interesting topics (thanks Susannah!) and the addition of Instagram this year to help me see everyone’s creative interpretations of the daily prompt. As for the diet challenge, going public kept me accountable so I only cheated twice, to celebrate a friend’s birthday with a little champagne, and a few sips of G & T while listening to some live music on a Friday night (hey, I’m not a saint and besides, no gluten was involved). I’ll write more about the autoimmune protocol results later, but I will say that blood pressure and TSH were greatly improved at my doctor’s visit this month. Yay! Hope everyone has a great weekend (and Labor Day in the US). “What’s new?” could be the overwhelming question of the year for me, especially this August. Everything is a first: new food, new diet, new cooking equipment, new kitchen, new living arrangements, new lifestyle, new world. I am nothing if not adaptable, but I may be taking things a little too far this time. Still, when I stop long enough to savor these unknown territories, I’m impressed with the view. Take these colors for example! Oh, the beauty of food in its purest form is always a wholesome revelation that I need pounded into my stubborn brain (and spooned into my mouth) every few months. I gaze at all those vibrant reds, yellows, oranges and purples, the source of my newfound health on parade, not to mention those multitudes of greens. I’m learning to be unafraid of exotic produce, to march right up to them and twist their little hats off, to peel them out of their skins, to slice them thinly and bathe them in coconut milk and olive oil, then toast them until they surrender to the touch. The stove may be a battlefield, but there upon the dinner plate this will always be their finest hour. They sit on our kitchen counter, available yet forbidden. 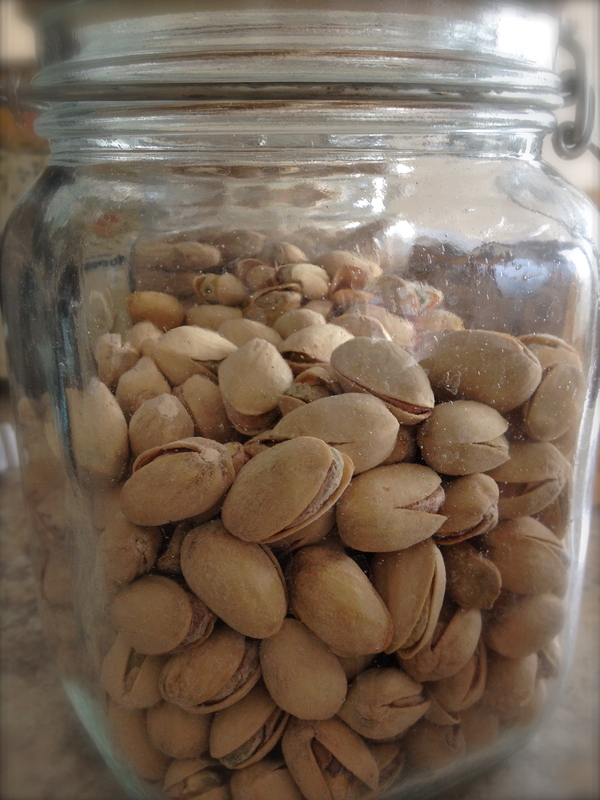 You see, pistachios aren’t allowed in my diet this month. It’s all I can do sometimes not to pop the lid off their clear container, and shuck little wooden shells off those delectable green nuggets inside. I watch my husband with envy as he absent-mindedly snacks over the trash can, litter falling like the premature leaves turning on trees outside. No, I can only hover beyond their barrier, the treasure chest of walls reflecting endless riches consumed in the not-too-distant future. Just wait until the end of the month, pistachios. 1. I hate to admit this, but I feel good. Better than I have in a long time. After a few rocky days at the start, I’m not missing the coffee, or the chocolate. Just really craving a good cracker along with my soup or a crunchy potato chip at lunch. 2. I’m meeting a lot of cool participants on Instagram, and quite impressed with the unique ways they find to illustrate the day’s topic. 3. The variety of ingredients I cook with is expanding rather than contracting in this elimination diet. And I’ve become acquainted with new foods such as fennel bulbs, kombucha, raw sauerkraut, and kale chips. Preparing everything from scratch requires me to slow down and relearn patience. 4. I get creative when I’m hungry. I’ve learned to throw whatever’s at hand into the blender in combinations I would never have considered before this protocol began. 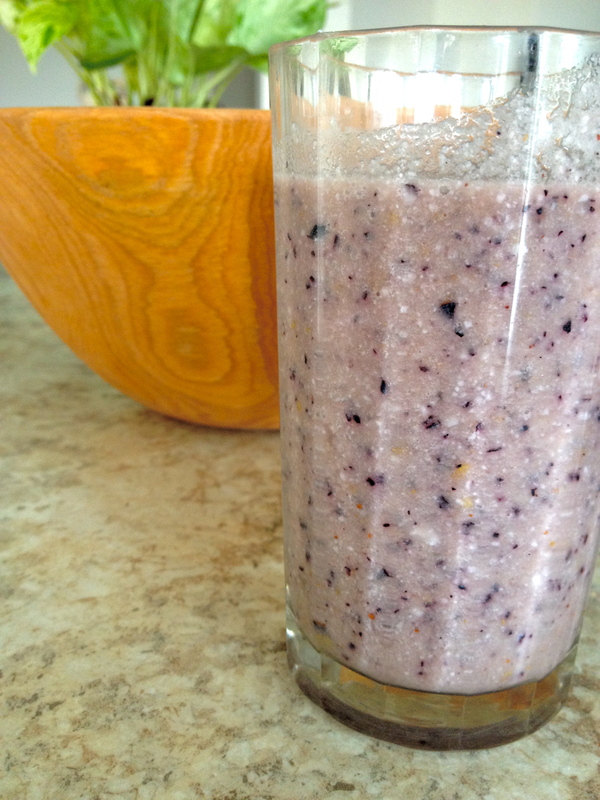 That’s a blueberry, pear and coconut butter smoothie in the picture above. My favorite so far and the perfect opportunity for today’s Instagram topic. 5. I’ve only cheated once on a little coffee, black with no sugar, and I only drank half. I didn’t enjoy it nearly as much as I expected. 6. These challenges take more planning and organization than I anticipated, but it’s not as hard as I thought. On to the second week.